The Official Guardians of the Tower of London – One of First 150 Struck! Visit England’s historic Tower of London, and you’re likely to see a small number of Ravens attracting the attention of visiting photographers and tourists. Normally thought of as portents of doom, these large black birds are actually the Tower’s official guardians. Why all the falderal about Ravens? Well, according to legend, King Charles II was told by a witch that should the Ravens ever leave the Tower, the Monarchy would fall. Not one to tempt fate, Charles decreed that the ravens should never be removed and today six birds are always on duty with a seventh kept as a back-up – just in case! The ravens are an enduring symbol of Monarchy, tradition, and history at the Tower of London. And now they’re also the theme of the first coin in a new four-coin series from Great Britain’s prestigious Royal Mint that pays tribute to the history and lore of one of London’s most famous royal castles. Struck in a quarter ounce of 99.99% gold, this majestic coin features a Raven perched below one of the Tower’s arches. He is depicted looking over his left shoulder – perhaps keeping an eye on one of the Tower’s famous ghosts? Not only is the first coin in in an exciting new series, but it’s also a first for the Royal Mint as it represents the first time that a special Tower mint mark has been featured on an official United Kingdom coin! The mint mark can be seen just to right of the Raven’s wings on the reverse of this £25 legal tender coin. Plus, your coin has been graded by the Numismatic Guaranty Corporation (NGC) as being in flawless Proof-70 Ultra Cameo (PF70UC) condition, a distinction that means your perfectly-graded coin will have ZERO imperfections – showing all features and fields exactly as the engraver and mint intended. In addition, your proof will also be certified as a First Strike (FS) coin by NGC, meaning that it was among the first struck by the mint and was verified within the first 30 days of issue. It will also be encapsulated with a special label indicating that it was One of First 150 Struck. It’s unlikely that today’s Ravens will leave any time soon as each bird has had its wings clipped to ensure they remain behind the Tower’s walls. They are also pampered in a way other birds could only dream about and are looked after by a designated Ravenmaster. If watching a few birds seems like an easy job, think again – Ravenmasters must first become a Yeoman Warder, a position requiring a minimum of 22 years in the military! Luckily for you, all that’s needed to gain the honor of protecting your own Guardian of the Tower is to make some room in your collection. Capture and share this fascinating piece of the Tower of London’s history by clicking one of these Gold Raven Proofs to your cart today! FIRST IN A NEW SERIES – The Legend of the Ravens Gold Proof is the first release in The Royal Mint’s Tower of London series. It also represents the first time that a special Tower mint mark has been featured on an official United Kingdom coin. 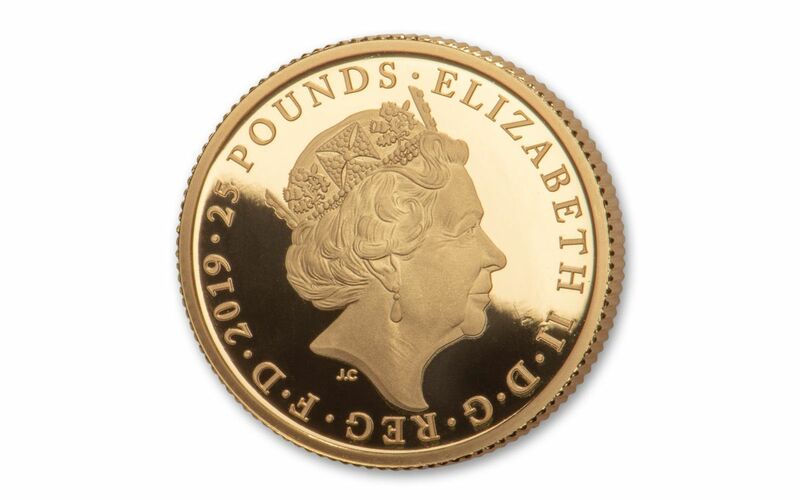 The coin’s obverse features the portrait of Queen Elizabeth II, the year date and denomination. Along the edge is an inscription that reads: “ON INTO TWILIGHT WITHIN WALLS OF STONE” from a poem by Samuel Rogers called Human Life. STRUCK IN HIGHLY-PURE GOLD – Each Tower of London Ravens Gold Proof is struck in a quarter-ounce of 99.99% gold. 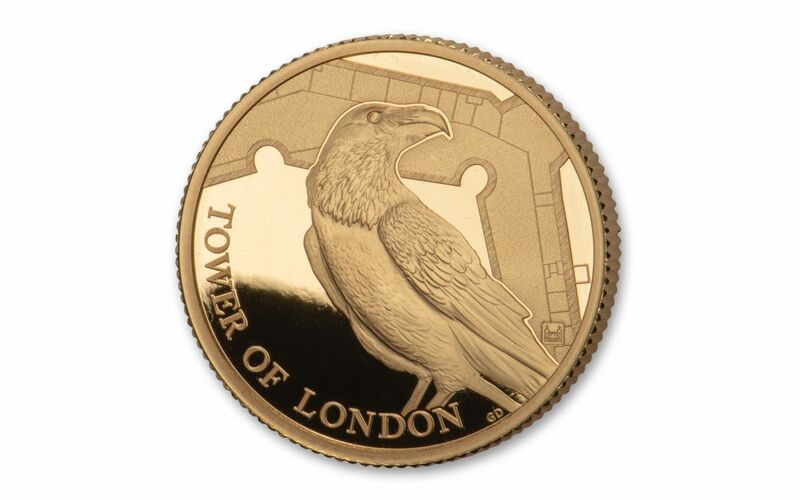 LEGAL-TENDER COINAGE – These Tower of London Ravens Gold Proofs are £25 (twenty-five pounds) legal tender in Great Britain. 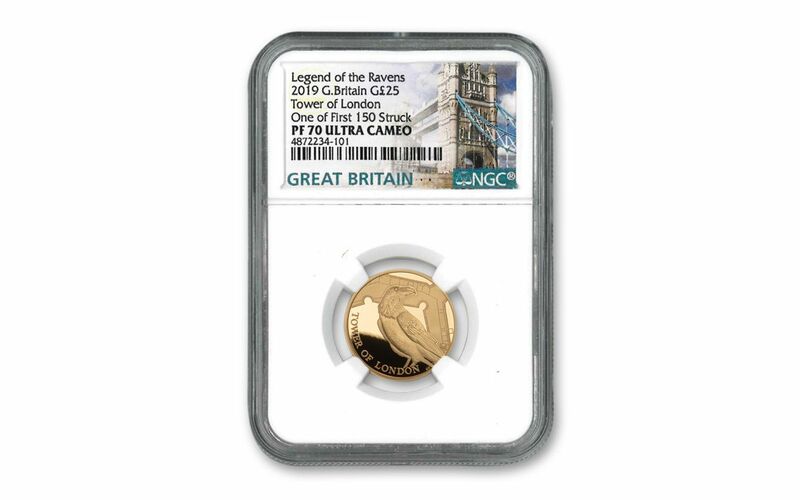 GRADED IN PERFECT PROOF CONDITION – Your 2019 Great Britain £25 Gold Tower of London Ravens Proof has been graded by the Numismatic Guaranty Corporation (NGC) as being in flawless Proof-70 Ultra Cameo (PF70UC) condition. KEY FIRST STRIKE CERTIFICATION – Your coin will also be certified as a First Strike (FS) coin by NGC, meaning that it was among the first struck by the mint and was verified within the first 30 days of issue. It will also be encapsulated with a special label indicating that it was One of First 150 Struck. 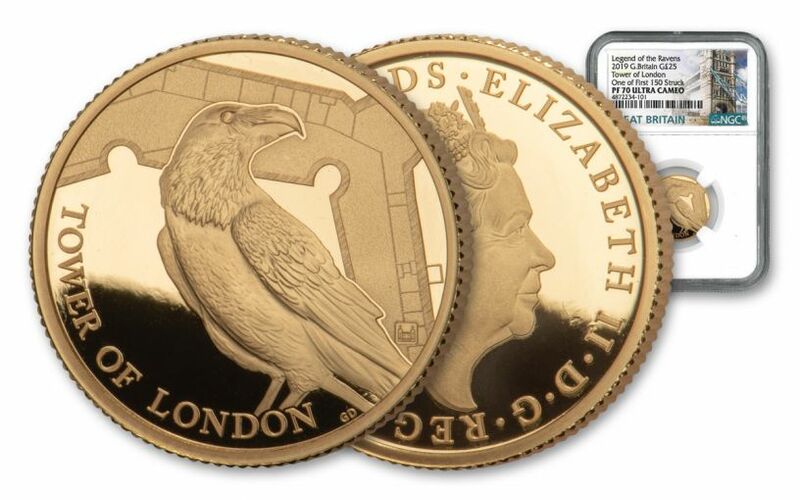 VERY LOW LIMITED EDITION – The maximum worldwide edition limited for the 2019 Great Britain £25 Gold Tower of London Ravens Proof was set at only 960.